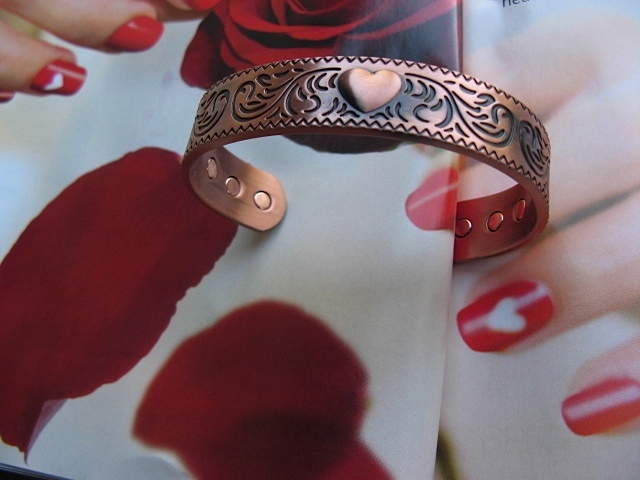 > Ladies 7 Inch Solid Copper Magnetic Cuff Bracelet CBM219L- 5/8 of an inch wide. The bracelet is approx. 6 1/4 inches from end to end leaving a 3/4 to 1 inch gap underneath the wrist, which allows the bracelet to slide on and off easily. We ordered one bracelet and liked it so well ordered 2 more , just returned from S. Car. and my sister admired them so much she has ordered 2. They help with my wrists as I am an organist for our church and it seems to relieve the pain from arthritis. Thank you so much.